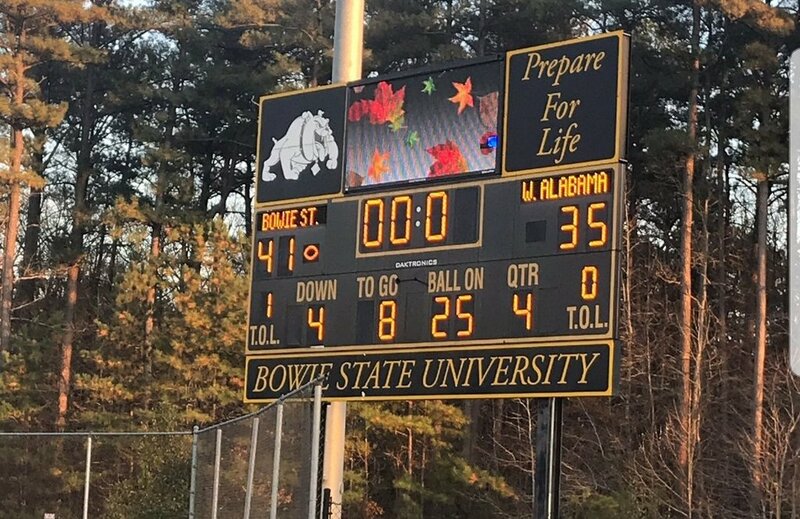 It was clear from the start that Bowie State was not overwhelmed by the NCAA Division II playoffs when hosting West Alabama at Bulldogs Stadium. The Bulldogs learned valuable lessons in last year’s first round loss to Delta State so when things went from comfortable to precarious there was a calm about the 2018 CIAA Champions where they knew how to win. After blowing a 13 point second half lead, then relying on the defense to hold off the Tigers off for one last drive, Bowie State advanced with a resilient 41-35 victory, which continues their historic season. The Bulldogs will face the number one seed in the Super Region II at Valdosta State. Bowie State carries the banner for all HBCUs in this year’s Division II playoffs. There were several other programs that had arguments for inclusion in the post-season tournament in what could be referred to as the region of doom, with four teams from the Gulf South Conference who made the postseason. This was the biggest win in the history of their program and brought credibility back to the CIAA. The conference hadn’t won a game of this magnitude since the great Winston Salem State played for the national championship in 2012. With Albany State losing in the SIAC Championship to Miles and Virginia Union, Morehouse, nor Tuskegee making the field of 28, carrying the mantle for HBCU football was something Bowie State recognized and wore as a badge of honor. “We don’t take that lightly,” Bowie State head coach Damon Wilson to the AFRO. “We know that we are representing HBCU’s in these playoffs and it was important for us to play well”. BSU quarterback Amir Hall was almost flawless playing an all around game where he produced 411 yards total offense. His 31 of 48 360-yard one touchdown performance was more efficient than it was spectacular. Hall picked his spots spread the wealth to four different receivers as West Alabama focused on making things difficult for all-CIAA receiver Lansana Sesay. Sesay caught seven passes for 86 yards but never got loose against the Tigers secondary. However, he opened things for Jordan Crockett to erupt for 131 yards with his seven catches, including a 66-yard strike that led to one of Hall’s two rushing touchdowns. Things started ominously for BSU as West Alabama swiftly marched downfield on their opening drive. When Harry Satterwhite capped their seven-play 78-yard march with a nine-yard touchdown pass to Tyriq Martin, whatever energy in the building completely evaporated. Since their Symphony of Soul marching band remains suspended because of a hazing investigation, it was challenging to draw energy from the sparse late arriving crowd. However, the game swung on two massive defensive plays from Roger Richardson. Richardson’s 34-yard third quarter interception return set up Bryan Ellis’ three-yard touchdown giving them a 27-14 lead. He then clinched the victory with a 36-yard pick six in the fourth quarter that proved to be the difference in the game.